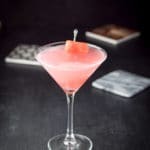 This wonderful watermelon cosmo cocktail recipe is so delicious that once you drink it, you will want it to star in your cocktail rotation! I remember the day when a cosmopolitan was made one way and one way only. Vodka, triple sec, lime and cranberry. Today, they have all different flavors. But this time, it’s fun because I ventured into making my own watermelon infused vodka. Making infused vodka is fun and easy so I’d recommend you do it at least once!! What type of cosmo do you like? Do you like the original or do you like the ‘newfangled’ ones? I’ll freely claim that my favorite cosmo is the blueberry mint cosmo. So, do you see that watermelon infused vodka? Do you? DO YOU? So we have the watermelon infused vodka, before I’ve fished out the chunks. We also have Cointreau, lime juice and cranberry juice. Yes, the cocktail shaker needs its own heading! Let’s fill that sucker halfway with ice! Now, I measure out 2 ounces of watermelon infused vodka. I pour the vodka in the cocktail shaker! Time to measure out 3/4 ounce of Cointreau! Oh, cocktail shaker, where are you? Oh, there you are, my beloved! I pour the Cointreau in. I squeeze a lime and measured out 3/4 ounce. I measure out 1 ounce of cranberry juice. Time for the cranberry juice to meet the rest of the ingredients. I cap the shaker and shake, shake, shake it at least 20 times. Then, I grab my martini glass and strain the contents into it. I also spear 2 fresh watermelon chunks on my martini pick and plop them in the cocktail. Shall we see the vertical view? Don’t forget to leave me a comment to let me know what cosmo you like to order when you go out!! If you’ve tried this watermelon cosmo or any other recipe on the blog, I’d love the hear what you thought about it in the comments below. I love hearing from you! You can also FOLLOW ME on FACEBOOK, TWITTER, INSTAGRAM and PINTEREST to see more of my delicious food and delightful cocktails! This watermelon cosmo is so delicious! Lightly flavored and refreshing! 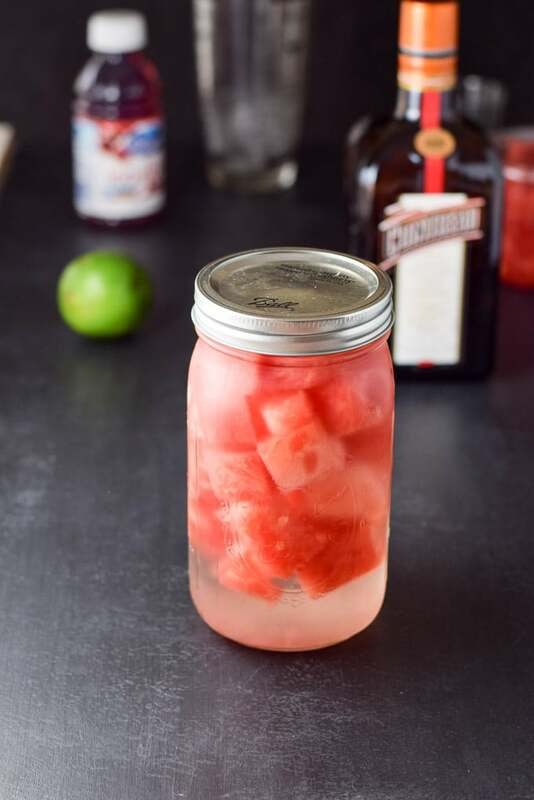 You don't have to make your own watermelon vodka, you can buy it if you like. But homemade is fun and easy. This looks like my ultimate cocktail! I’m a cosmo girl through and through and this twist sounds amazing! Thanks Cliona. One of my cousins love, loves, loves cosmos. So, I’m always trying to figure out a different drink for her! What a delicious, not to mention ‘pretty’ drink! Perfect for this season when watermelons abound the supermarkets! Perfection! Watermelon infused vodka sounds to die for. I love this idea and could see it being tasty in so many different cocktails. I am huge fan of cosmopolitans! Cheers! 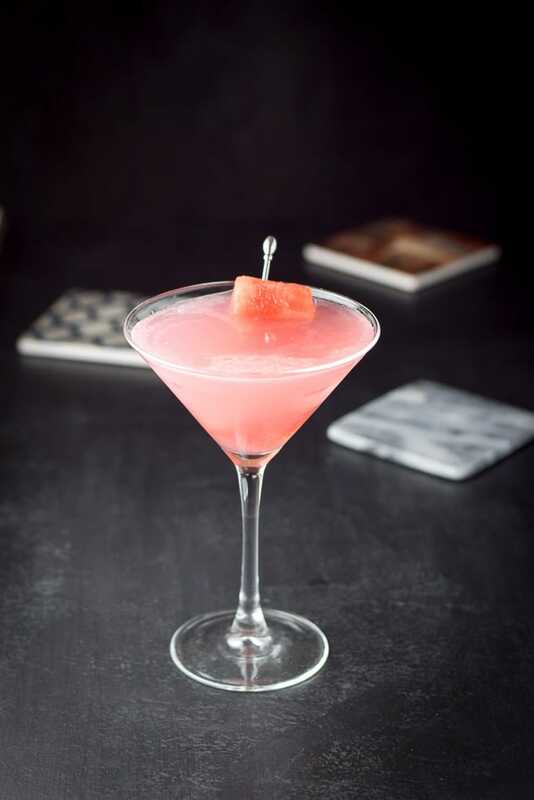 Watermelon and Cosmo – what a combo! Love this idea. I will drink it all summer long. Ingenious! Never would have thought of using watermelon for a cocktail. Beautiful photos too! This is the perfect cocktail for the summer now that watermelon is in season! I love this! I will be making this for my next girls night in. Thanks Katie! It is pretty perfect! !